with no agency oversight infrastructure to export and transport fracked gas from fracked gas pipelines such as the Sabal Trail Pipeline and others. The comment period for the public – in link above – is for you to have input as to whether fracked natural unregulated, small-scale LNG processing facilities should be approved. Please take this opportunity to answer with a resounding NO! These new small scale LNG facilities that are now being ‘pushed’ by our government via executive order by President Trump on this past Labor Day and with the blessing of invested Governor Rick Scott will affect all Floridians as well as all areas of the USA. 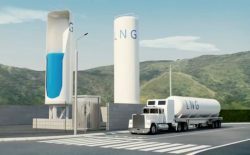 There are already LNG ‘gas stations’ in Georgia for instance and I am sure across the country as UPS is using LNG to run their semis. Did they forget hydrogen like Norway and Germany use? The plan is to reduce volume or capacity of fracked gas by converting it to a liquid state, an unstable state, called LNG which makes for easier transportation and storage via train, ships and trucks all over the USA with the proposed, unregulated small-scale processing plants being located near pipelines and inland ‘ports’ in populated areas – such as Miami, Orlando, Jacksonville FL (Jaxport) – all across Florida and the USA. Transportation of fracked gas from these small scale processing plants will be both for export to other countries and transported to various ports across Florida and the rest of the USA inland on our highways via truck and via trains, creating what are commonly referred to as bomb trains and bomb trucks because of the instability of LNG. This proposed process will begin, if we do not stop it, as fracked gas is delivered to small-scale inland LNG Processing Facilities via gas pipelines such as the Sabal Trail Pipeline (Straight from the Marcellus Fracking fields) which spans 515 miles from Alabama, through Georgia and into Florida where these unregulated inland processing plants are to be built in populated areas just as they are in other export areas of the country. These are the same areas from which the gas will be transported by truck or train to export terminals. Note that export of LNG to other countries by large port terminals has already begun in Jacksonville and Hialeah Fla. The proposed Titusville Fla. export terminal which is owned by subsidiaries of Fortress Investment Group — parent company of All Aboard Florida and Florida East Coast Railway — “within seven years could build, own and operate a liquefied natural gas facility in Titusville, according to a free-trade agreement approved May 29 by the federal Department of Energy” – This approved by DOE in 2015 would increase tenfold the amount of LNG traveling our railways in Florida and has come to pass in Florida. About 30 billion cubic feet of liquefied natural gas could be transported annually along the 351-mile Jacksonville-to-Miami rail corridor! More on this story here. Additional export stations are popping up all up and down coastal areas of Florida, Louisiana, Texas, Maryland, Oregon, Alaska and more. Cecile Scofield of Florida, is an expert on the subject of LNG export terminals and can be credited with halting Hess from building an LNG terminal in Boston. Watch her very informative video filmed at a recent WWALS/Suwannee Riverkeeper event in Live Oak Florida here. Please continue reading to understand exactly what LNG is and the threats it is to our very lives. If additional unregulated small scale operations for processing LNG with zero oversight is allowed then we are will see even greater dangers to our lives, water and ecology. The process of liquefying natural gas is to reduce the volume of natural (fracked) gas to facilitate storage and transportation. This process causes instability and increases the dangers of transporting natural/fracked gas by expanding from pipelines to our railways and roadways. We will be blogging more on this subject with expert input on points to address in your comment to the Federal Registry (DOE) as well as a sample comment for you to follow. Folks this is just as bad if not worse than the Sabal Trail Pipeline and others across the nation. Please share this blog via email, Facebook, Twitter, etc. Thank you! *Thank you to WWALS.net and Cecile Scofield for providing some of their valuable information contained in this blog. People refuse to believe Science. My father died in a mine explosion in WVA. Methane is a KILLER, but oil, gas barrons don’t care. They just collect the check, they are not placed in danger. Sad what our country and the world has come too. Yes you are correct Pam. I am saddened to hear about the death of your father in a methane induced mine explosion. Oil and gas companies as well as most every large corporation are all about the money. Human lives mean nothing to those that run these companies. Just the bottom line. We also are not prepared for an emergency involving large amounts of people and property. Even when given warnings like when natural disasters occur, systems are overwhelmed in both response and after effects. Many small and even large agencies are unaware that these disastrous events are so close to occurring. An accident would be a disaster; a planned incident would be catastrophic. You are exactly correct Ms. Gray. As seen in the link below in Martin County Fl whose officials are very concerned and estimate a tenfold increase in rail transportation should these inland LNG Terminals be approved. None of the emergency agencies in Fla are prepared for a pipeline or LNG transportation incident as fracked natural gas explosions can not be extinguished – the gas has to burn off. Once one blows the only advice is, if you are not incinerated is to “Run like hell”. Thank you for your comment! Not only that, many of the counties that they are transporting liquified and compressed gas through have little awareness of that fact- much less a comprehensive disaster and response plan that will be appropriate. In some areas of rural Florida it takes 20 minutes to even mobilize the response and rescue personnel- and that is for a car accident.